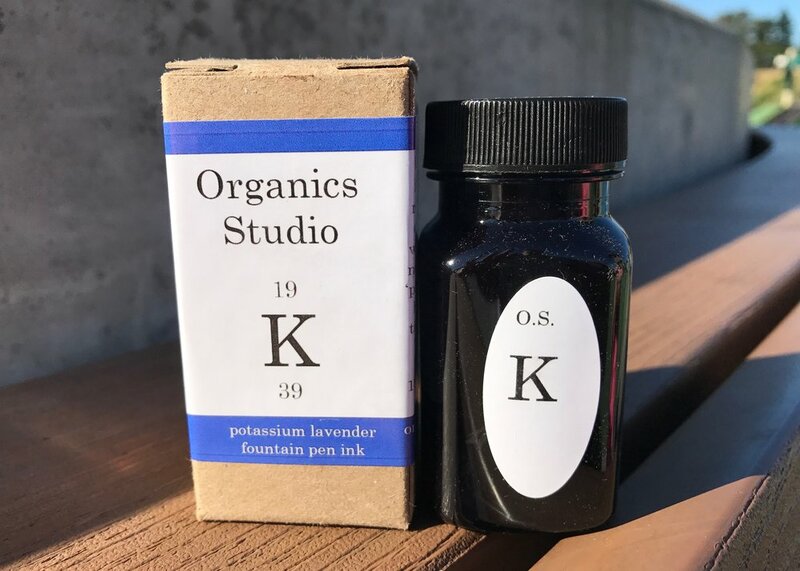 Organics Studio Potassium Lavender is a new-ish color from the Organics Studio Elements line. Quick side note: I did the lettering pictured above using a Caran d'Ache fiber tipped water brush-I'm 100% in love with it, because it's amazing. I got my bottle of ink from Pen Chalet. It holds 55ml of ink, and the ink is handmade in Maryland. Yay for US made. I'm gonna call this color almost a periwinkle. It's a purple with blue in it. When I first switched this ink I was wasn't sure about it, but the more I played with it, the more I started to love it. This ink really reminds me of Robert Oster Evening Sapphire, which I'm obsessed with. Potassium Lavender just has a little more purple to it, but they have similar tones to them. Ink swabs for comparison, left to right (top to bottom for RSS): Robert Oster Evening Sapphire, Organics Studio Potassium Lavender, and J. Herbin Eclat de Saphir. To see the Organics Studio inks together, click here. Sailor Jentle Nioi-sumire, Nemosine Alpha Centauri, and Sailor Jentle Shigure. To see the purple inks together, click here. I used a broad Vanishing Point on Original Crown Mill stationery. Pros: I actually really love the color-it's a pretty unique color. It's really well behaved, and has some decent shading. Cons: The dry time is a bit long. Overall, I'm super glad I have a whole bottle of this ink, because I will use it all. Disclaimer: This ink was sent to me free of charge by Pen Chalet, in exchange for an honest review. There are no affiliate links on this page.